Is your pet a pampered lounge hound or a nonstop, energetic dog? Either way, a dog bath, exercise program, or other dog spa services might be just what your dog needs. 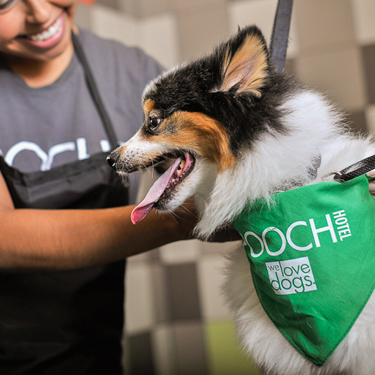 The Pooch Hotel spa has a variety of unique services you and your dog will love. Need a dog bath or some dog grooming? How about a trot on the treadmill? Let us take care of your pet’s every need, whether that’s a new hairdo, a workout, or some relaxation time. Our spa has a little bit of everything. Our experienced, caring spa partners make your pet’s visit both safe and enjoyable. Start your pet off with dog grooming options such as gland expression, tooth brushing, or a dog bath. Next, add dog spa treatments that pamper and style your pet, such as a facial, pawdicure, or brush-out. Our spa partners always have your dog’s well-being in mind. That’s why we also offer fitness activities to keep your four-legged family member healthy and active. Before a dog bath, have your pet take a spin on the treadmill or give your energetic water-lover dog time to splash around in the pool. * For the dog that can’t get enough attention, schedule an individual play session before a dog grooming appointment. We have a variety of options to help make your dog’s spa visit active and healthy. Our spa partners know when it’s time to pamper, when it’s time to exercise, and when it’s time for a little rest, and relaxation. Our dog spa treatments can also include a luxurious rubdown for your pet. And if your dog is staying overnight at Pooch Hotel, we can deliver turn-down service, complete with a tummy rub, right in the comfort of your pet’s suite. No matter what your pet’s unique needs and desires are, we have dog spa treatments that will hit the spot. A service at our spa is more than just a dog grooming or dog bath. It’s another chance for us to ensure the well-being of your pet! *Indoor pool at select locations. Services and prices vary by location.